The atmosphere at one of our local primary schools was special this day, as it was hosting an important day in the lives of many children. With the Zambian flag flying high, teachers struggled to keep children together as there was so much to see. Younger students could be seen peeping through the classroom windows, trying to catch a glimpse of the older boys moving around outside the school, carrying drums over their shoulders while the girls set-up decorations in the school hall. They just couldn’t wait to dance to the rhythm of those big drums. International Day of the African Child has been celebrated on June 16th every year since 1991, after it was initiated by the OAU, the Organization of African Unity. It honors those who participated in the Soweto Uprising on that day in 1976. In the Soweto Uprising, black South African students led protests against the discriminatory policies of the Apartheid government. The event is historically significant for the extreme police brutality the students faced, and its role in bringing international attention to the cruel realities faced by black South Africans. The Day of the African Child brings with it an important aspect in the lives of African children and those of different nationalities across the world alike. 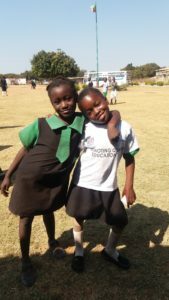 Sara with her best friend Rose during Day of the African child celebrations. Charity, the headteacher at the school, together with other members of her school staff, took their places as everyone joined them for the national anthem. Afterwards, Charity and Save the Children staff spoke to the crowd on the day’s activities. The atmosphere was filled with pride, as Zambia has enjoyed 52 years of peace. Looking around the crowd, one could also see the pride that came along with being an African child, as children eagerly listened in. Standing beside her mother, 8-year-old Sara struggled to sing the anthem to perfection but still understood the meaning of the song and the words to it. Probably one day when she’s a bit older, its words will mean even more to her. “She’s so anxious to learn new things and never stops asking me questions. Being a Caregiver myself, I have no problem as I teach younger children so I understand her,” says Sara’s mother, Phales, who is in her mid-twenties. 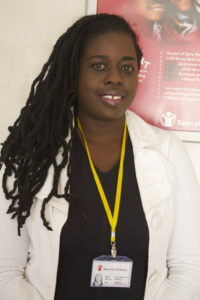 As a Save the Children Caregiver, Phales teaches in the Early Learners center in their community, working with children ages 3 – 8 in developing their learning skills in sponsorship supported programs. She also assists sponsorship operations, for example, helping children reply to sponsor letters. 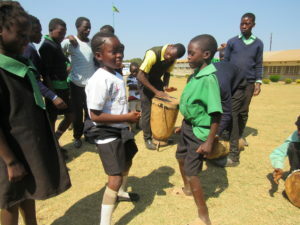 Sara dancing with her classmate Reuben during Day of the African Child celebrations. A spectacular show filled with drumming, dancing, and educational poems had even the children in the back rows of the hall on their feet, as they struggled to see what was happening ahead. Poems were also shared by children on topics related to child protection, equal opportunities, and child empowerment. Luckily for Sara and her mother, together with some of the other younger children, they were given seats right in the front row. With organizations like Save the Children giving a second chance to the lives of many children through bigger and brighter education opportunities, every last African child can shine and contribute positively to their society.